Protection of the Laminate Floor – Floor Finish top coating increases the protection for the laminate flooring for the extreme amount of foot traffic experienced in a commercial building. This is especially true in a retail store. Cleaning of the Laminate Floor – Floor Finish top coating makes the cleaning process easier and more effective in extreme foot traffic conditions. Beautiful Laminate Floors – Floor Finish top coating keeps the gloss levels high which is what many commercial buildings and retails stores desire. Cleaning Laminate Flooring – High Gloss: For Retail Stores and other Commercial Buildings desiring a high gloss look for the facility, the selection of a quality floor finish will need to be determined based on whether the floor finish will be used with either high-speed buffing, limited buffing or no buffing. Many floor finishes on the market provide high gloss but achieving high gloss levels can depend on many factors; several to consider is the age of the laminate floor, the available equipment to clean and maintain the floor and the amount of labor budgeted for the upkeep of the floors.It is important to remember that the primary reason for using a floor finish on a laminate floor is for the actual protection of the floor. Protecting them with a floor coating will extend the life of the laminate floor and increase the life cycle of the flooring itself. Thereby reducing the capital expense of replacing the floor covering.Many Wal-Mart Stores now use laminate flooring in sections of their stores as do many other retailers. 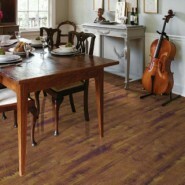 They use a floor finish for the reasons explained earlier; Protection, Easy of Maintenance and Beauty. Cleaning Laminate Flooring – Matte Gloss: For Commercial buildings that require or desire a matte (Low) gloss look for the floors, there a several floor finish manufacturers that have matte gloss floor coatings available, Diversey, Inc. is one of the more recognizable suppliers of floor finish (wax) including a matte gloss floor finish. Always consult and review the Laminate flooring manufacturer’s warranty for cleaning procedures and recommendations and gain approval from the manufacturer before using a floor coating on the laminate flooring. Some laminate floor manufacturers are strict about the maintenance of their flooring and many do not want a floor finish coating used on their floors because they are sold as a wax free solution to maintaining the laminate. However, if you are a large commercial user and as the floors begin to wear out due to foot traffic in a commercial environment, most of the laminate manufacturers will allow top coating with a floor finish. This will allow them to avoid replacement cost of the flooring due to premature wear caused by extreme or high foot traffic. Again, it is always a good idea to check the warranty and with the technical department of the laminate floor manufacturer prior to using a floor finish on their floors.